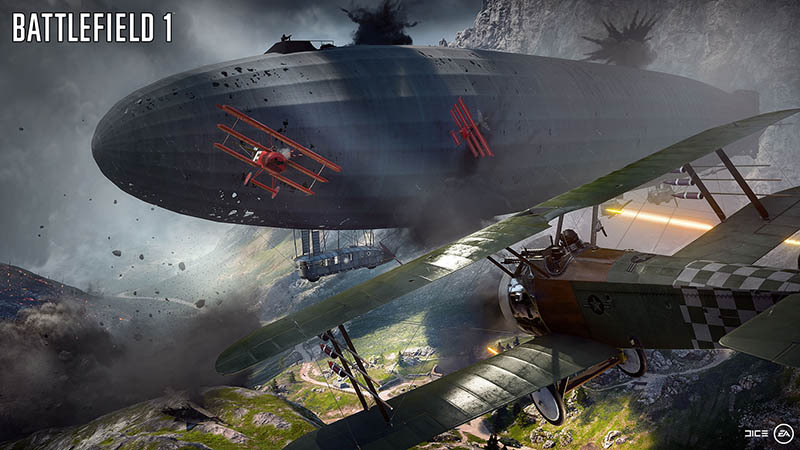 There’s a ton of new stuff to see in that trailer – including a better look at Behemoths, some of the largest vehicles in Battlefield history. You’ll find a whole lot of new info on these (and a lot more) on Battlefield.com, too. You look into the distance and see planes torn apart by gunfire, their debris raining down over London. In war-torn France to the east, horrible armored tanks tear holes in walls as they roll through crumbling cities. To the south, past the burning Italian coast, men charge over the sand dunes of the Arabian Desert, armed to the teeth with the most powerful weaponry the world has ever seen. This is what the dawn of all-out war looks like, and it’s Only in Battlefield 1. Battlefield 1 is releasing worldwide on October 21, 2016 for Xbox One, Origin on PC, and PlayStation 4 but you’ll be able to get your hands on it much sooner. More on that in a minute. When we started working on Battlefield™ 1, we started looking at how we could evolve and improve a number of Battlefield staples, including the roles you can fill. Classes have been a part of Battlefield since the beginning – whether you were deploying as a Medic in Battlefield 1942 or an Engineer in Battlefield 2142, you’ve felt the impact of how Classes change the game. This time around, we saw opportunities to make some changes, both in the roles of the different Classes and the general effectiveness of every Class in combat. Thanks for Watching Battlefield 1 Trailer 2 – Official Gameplay , Please Leave a Comment for Review ! !